I’ve got a quick Talisker today, one of my favourite distilleries. Independent Talisker is rare as hell, so I jumped on the opportunity to try this one at the Whisky Show. 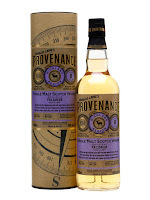 This is a bottling by Doulgas Laing for their Provenance series. As with most indie Talisker, its young, this one is 8 years old. Nose: Woah, very different from the officials. A really fruity Talisker, lots and lots of kiwi, none of the black pepper spice I would expect. Taste: Again, more of the same. Fruity with lots of kiwi, a little pepper and sea salt into the finish. A little thin for a Talisker though, reminds me of Storm (Not a good thing). Finish: Short/Medium length. Fruit and oak but unbalanced. I really wanted to like this but it feels mediocre compared to the 10yo. I would take Skye over one of these, and that really is a shame because these aren’t cheap either (about £55).